ROE-A series is an absolute encoder that uses Gray Code and reports the shaft angle within a 360oC range. 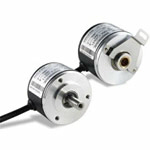 As compared with other type of encoder, it can remember the position according to the mechanical position of the encoder. It means that the absolute position can be found and memorized without searching reference point. Purchase your Delta ROE-A Series Rotary Optical Encoders today!